Eating mandarins may cut the risk of developing liver cancer and other diseases, research suggests. Japanese scientists found the key were vitamin A compounds called carotenoids which give the fruit its orange colour. And a second found drinking the fruit's juice cut the risk of patients with chronic viral hepatitis developing liver cancer. Almost 2,800 new cases of liver cancer are diagnosed in the UK each year. In the first study, scientists at the National Institute of Fruit Tree Science surveyed 1,073 people in the Japanese town, Mikkabi, in Shizuoka, who ate a high number of mandarin oranges. They found chemical markers in the population's blood samples linked to a lower risk of several serious conditions. In the second study, a team at Kyoto Prefectural University of Medicine studied 30 patients with viral hepatitis who had a daily drink containing carotenoids and mandarin juice for a year . After a year, no liver cancer was found in the group, compared to a rate of 8.9% among a group of 45 patients with the same condition who did not drink the juice. The Japanese researchers admit more work is needed and plan to continue the study for five years. Ed Yong, of the charity Cancer Research UK, welcomed the research but said the sample size needed to be larger. 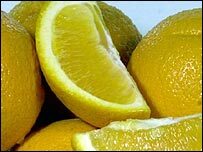 He said: "With only 75 people, this study is far too small to tell us anything conclusive about the links between mandarin oranges and liver cancer. "Smoking and cirrhosis of the liver, caused by excessive alcohol consumption, are more likely to affect your risk of liver cancer. "It is unclear if any specific fruits have particularly strong benefits." Cathy Ross, cardiac nurse at the British Heart Foundation (BHF) said: "This research appears to support the BHF recommendation of eating at least five portions of fruit and vegetables a day, to help reduce the risk of cardiovascular disease. "Different coloured fruit and vegetables contain different vitamins and minerals, so the more types of fruit and vegetables you can include in your diet the better."